A google sign, one of many around the Google campus. 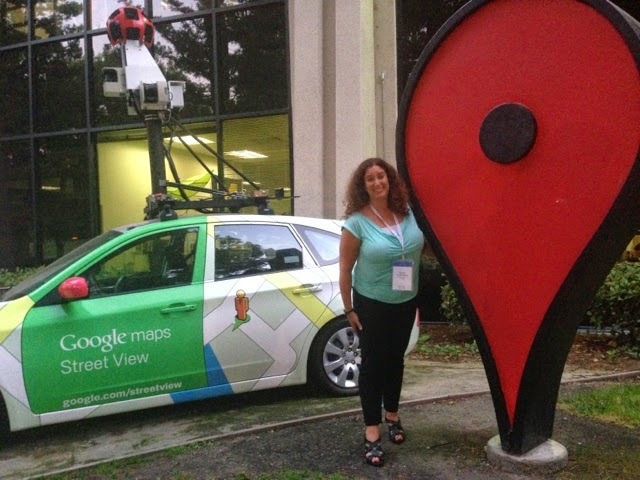 A few months back I had the pleasure of presenting at the GAFE Summit in West Vancouver. 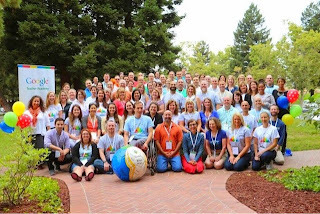 I've always been curious about these summits as I like using Google products to collaborate and learn with others from around the world. 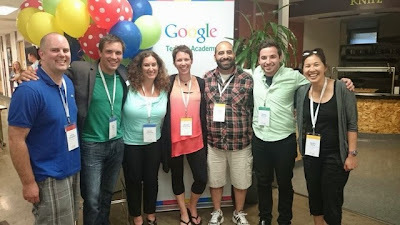 While at the summit I was talking with some of the crew and they mentioned that Google was taking applications for its teacher academy and suggested that I apply. Being from British Columbia (with some of the tightest privacy laws in North America) and a teacher of grade one students, I wasn't sure if this was really something I should be a part of. Plus I teach in a 1:1 iPad classroom, and I've never touched a chrome book. In addition my school district runs from most things Google. But I love to learn and connect with inspiring educators so I applied. The application process consisted of a written portion and a short one minute video. If you're interested here's mine. To my surprise my application was accepted. At first I was invited into G+ community and things were buzzing. 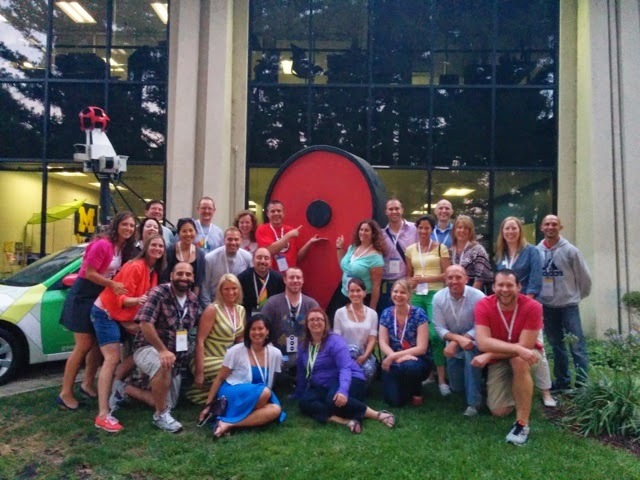 It was exciting to get to know some of my cohort. I was thankful I already knew a few of the family from my on line PLN and even more thankful that my good friend Cheryl Steighner was also accepted into the program. I was also happy to see that Mary Berelson was a K/1 teacher and Roland was a grade two teacher. In addition I found out that there would be six other Canadians, including Bryson Norrish, from Vancouver. At ISTE in Atlanta many of the group was there. Because of my nutty schedule I wasn't able to meet everyone during their arranged meeting times but I did get a chance to meet a few at some of the functions I was at. 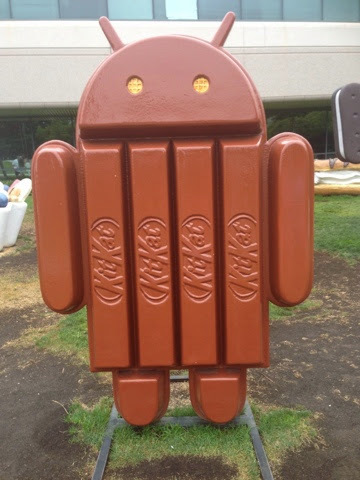 That helped a lot too, making it less of an unknown when I arrived at the Googleplex. 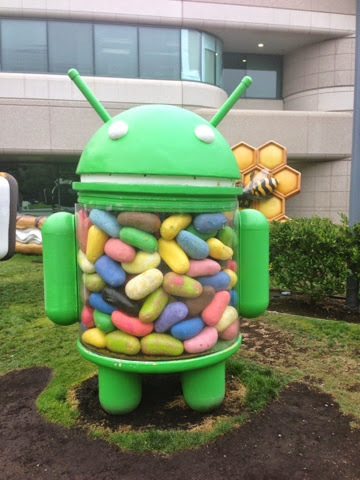 A cute Google Android display inside the main building. 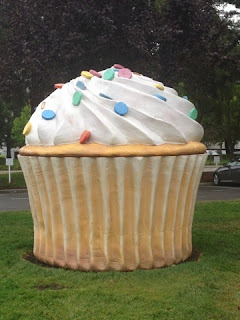 Fast forward to last week, and I arrived in the Silicon Valley. Having just been in California the week earlier I decided to extend my visit by arriving early, and leaving a few days after the academy. 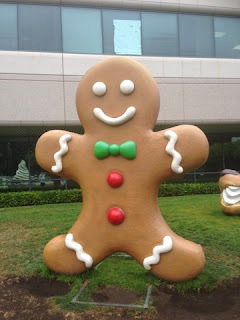 I was really glad I did, and there will be another blog post about my adventures in the Silicon Valley. I sure loved it there. But I digress. Tuesday night fellow GTA MTV14 (that's the Google cohort we are a part of) Caren MacConnell arranged a get together. Many of us attended and it was great to get to know some of the family a little bit better. 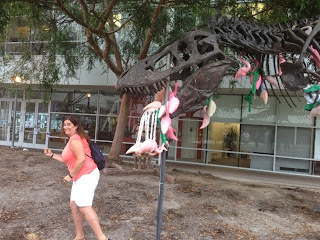 Wednesday morning I arrived with my awesome roommate Lisa DeLapo in Darren Massa's mini van. Wow! Darren was the most generous driving host and even entertained us with Frozen and the Lego movie snippets. :-) Many of us were standing outside the building. I'm certain many were as nervous as I was. 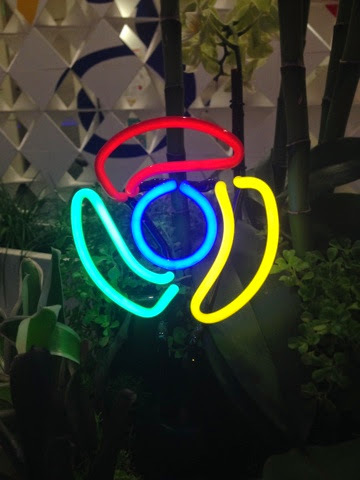 Just after 8 am the doors opened and we were warmly welcomed with a delicious Google breakfast. Like while in San Diego at the Apple Institute food was never lacking at Google. Heck there were mini kitchens around every corner just in case you needed a snack (or six) between meals. I quickly found out that I was in the green crew. I sat at a table near the front and was joined by others. Our first task was a team building one using raw spaghetti and marshmallows to create a tower. We were moving along really well until our base had some issues. It was a good team building though and it was here that I met another Canadian, Sandra Chow from Ontario. We learned a bit more about the academy and what was in store for us, and saw some demo slams. 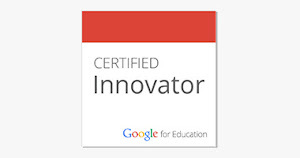 We talked about moonshot thinking and in small groups we talked about ways we could solve various problems using different google tools.. Then we were then separated into our groups for our first session with our lead learners - fellow Google Certified Teachers. My first session was with Lisa Highfill where I learned about Hyper Docs. This made me smile as only just a week earlier I was learning how to use Keynote to create hyperlinked presentations. While not the same, Hyper Docs is something I'd love my students (more likely with their big buddies) to create to show/share learning and teach others. It could even be something we do collaboratively with a class some where else in the world. (Yes, my brain things big!) If you know me at all I'm all about my young learners creating content vs me curating for them. It was fun to explore what Lisa and curated for us and I appreciate that she added a grade one example to the mix. 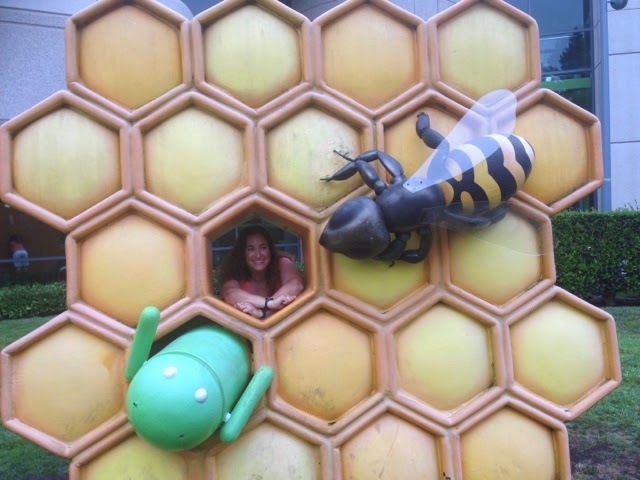 To get to our session we walked through the building and saw the Googlers busy at work. It was cool to see their working environment. Then we met as a group again and tried to identify our own problems. We then met in groups to discuss possible solutions to our problems. Next was lunch. The group was split into two groups (we were too big to take over one cafeteria) and off we went to one of the many Google cafeterias on campus. Google ensures that their employees have all their needs meet - food, medical access, dry cleaning, car maintenance etc. Since we were part of the campus for two days we enjoyed the food perk too. 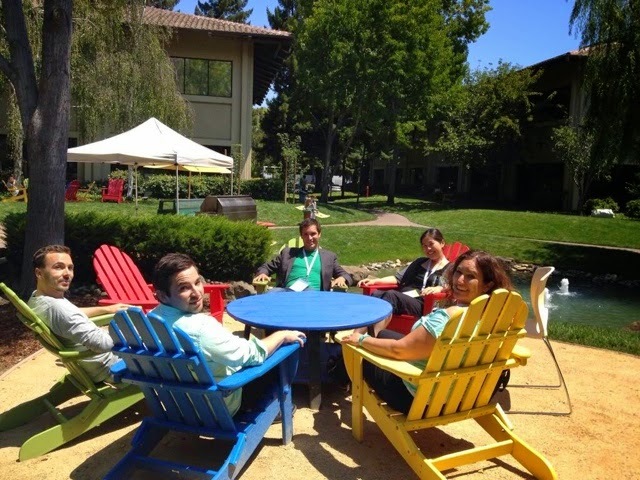 A quick rest after lunch on the Google Campus. After lunch we heard from three of our cohort members Michelle Triemstra, Jimmy Juianio and Michelle Armstrong. All nine cohort presentations were a highlight for me. We then had had two more sessions with lead learners. I had one with entitled YouTube MTV Video Teaching Awards (VTAs) led by lead learner Wendy Gorton where I learned a ton about YouTube and all the annotating you can do with it. Jimmy Julianio and I worked closely together and created our video nomination. Surprisingly we didn't win either but I think we both learned a ton in the process. My next session was with Cat Flippen, Thinking Inside the Sphere. Here we had some good discussions about how to help others transform their teaching. We then met up as a group again and learned from three more of our cohort members Lisa DeLapo, Allison Mollica, and Dan Bennett. As I mentioned above I love learning from my cohort members. It's great to peek into their world. Next up was the leadership portion of the day. We covered it in a pretty cool way by playing a leadership version of Minute to Win It. While I was not chosen to try one of the tasks, I loved watching some of my cohorts be challenged in unique ways. :-) Of course there was a leadership component too. Such a fun way to learn, and bust a gut giggling in the process. Then we learned a bit more about the google community before it was time for our pin/certificate ceremony. It was perfect timing because this was what my chrome book (which they lent all of us to use for the day) looked like. It was a long full day of learning. 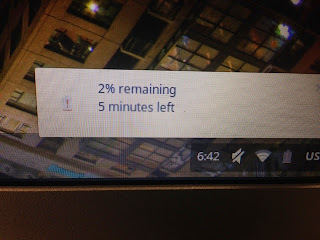 My Chromebook screen after a long day of learning. The ceremony was quick and efficient and we each received our ceremonial handshakes, certificate, and pin. 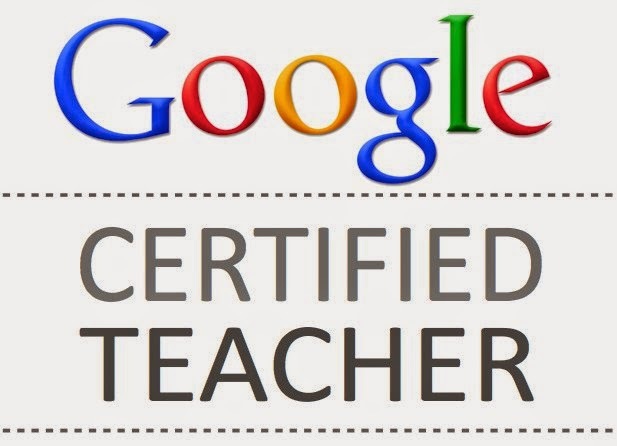 We were now officially Google Certified Teachers. Me with my certificate and pin. We then celebrated in style with a great meal and more conversation. Below is a picture of the seven Canadians part of this cohort. There were two from British Columbia, two from Alberta, and three from Ontario. While we may have been small in numbers we represented Canada very well. After dinner many of us explore the Google Campus a bit more. 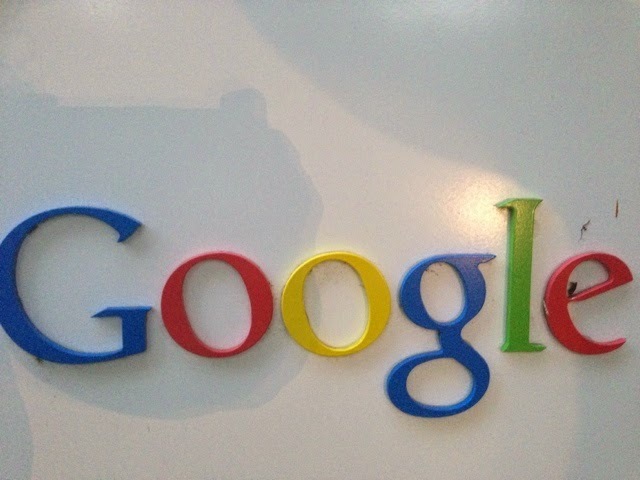 After all it's not every day you're on the Google complex. 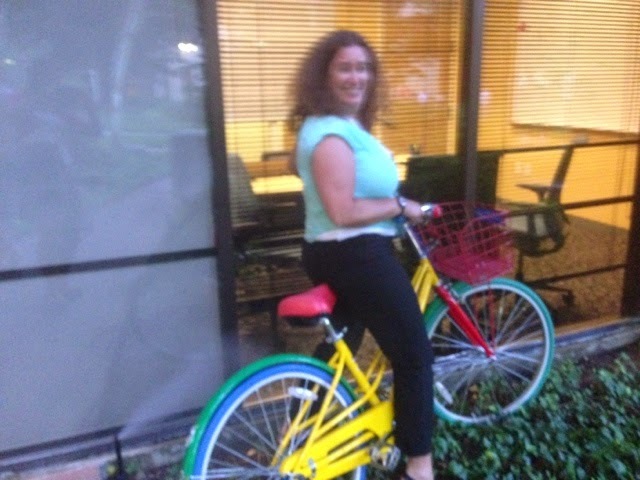 Trying out one of a zillion Google bikes on campus. 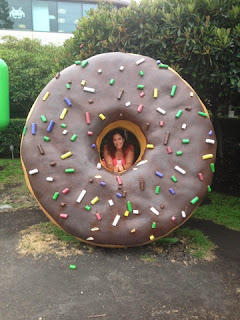 Me at the famous Google location pin. A whole bunch the cohort at the Google location pin. The next day we returned for more learning but first things first our cohort picture. We then returned to do this cool table challenge called the Amazing Google Race. As a team we did tasks, received clues, and did other tasks. Such fun and I loved the teamwork in action. While my team didn't win (again) we had a lot of fun in the process. Next up was our third session of cohort presentations this time by Susan Herder, Tim O'Connor, and Sandra Chow. Following these presentations we headed to our final two small group workshops. Running from the Google Dinosaur. They like to feed it flamingos. 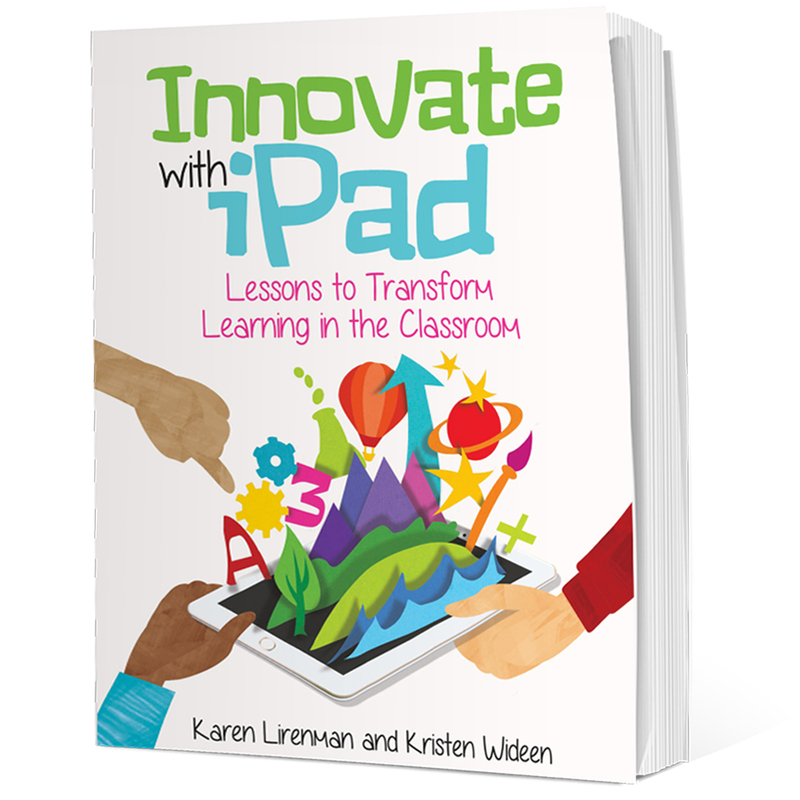 My first session was called Are You and Iron Chief with John Corippo and Jr Ginex-Orinion . Here we had a task to do, which included a special ingredient. It was a great way to explore Google Presentation while under a time pressure. I was impressed with what everyone was able to create. My final small group session was Field Trip: All Aboard the Magic Google Bus with David Theriault and Cory Pavicich. 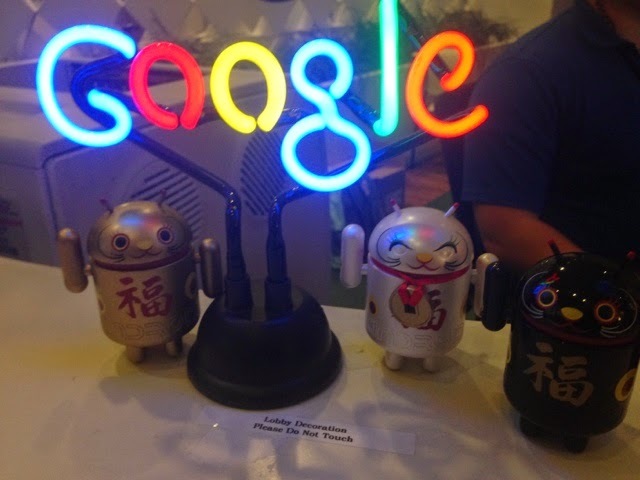 We played with some pretty cool technology called NFC tags. We searched for these chips, read the clues, and took images to match the clues. We then all shared our favourite images. After our morning break we took a look at our action plans again and how we can be agents for change. I love this part as someone who is often pushing boundaries I love that Google supports innovation for positive change. We then had another wonderful lunch. In the afternoon we had a mini ed camp. I learned with some other k-2 educators and then learned some tricks with the Nexxus 7 tablet. At this point our official 'learning' was just about over. We learned a bit more about what Google in Education is doing with educators and how we can be a part of it. With final closing remarks our time together was over. 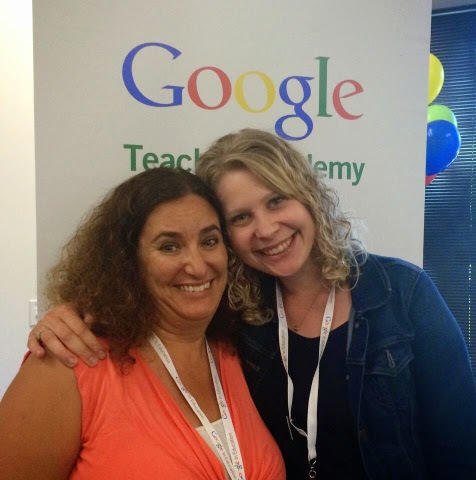 So great to be learning with my #eduparty friend Cheryl. Well almost over because we still had our trip to the Google Store! The 48 hours brought passionate inspiring educators together. At times I felt in over my head as I work in a non Google district and so much of what others were talking about I am not able to do with my students. In addition as a grade one teacher I am limited by what my students are capable or doing. I also strongly believe that my students should be creating their own work so I look at what I learn through their eyes. Thankfully there is still a ton I can do with Google products that work within the privacy laws of public education in British Columbia. In fact my action plan is being designed to show others what can be done with Google, even in a non Google environment. If you have any suggestions please send them my way. Here's to my new family! I look forward to continually learning and changing the world with you. It sounds like a wonderful time, Karen. So glad you had this opportunity. Karen, Thank you for the awesome summary. Thank you especially for the one on one tutoring you provided regarding Osmo and blogging ideas for little kids. Oh, yes! Especially thank you for the book Canada! I had a ton to do today, but as soon as I started reading I was hooked. Wonderful pictures and observations. Thank you for creating this memory scrapbook.